Persons who consider moving to Canada as a qualified pharmacist can do so in several ways. Moreover, there are many visa programs and categories to apply and we present the ways to immigrate to Canada for you in 2019 here. 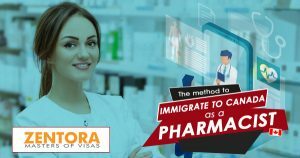 These programs allow them to immigrate to Canada as pharmacists. The MPNP has the top demand list of occupations and pharmacists appear on it. It works under the EE system, and when they apply, they are also likely to receive an invitation in an Express Entry draws happening frequently. Also, they must have excellence in the French language because there is an emphasis on approved French-test results. By scoring a 7 level on the CLB test for reading, listening, writing, and speaking one can apply to it. The FSWC allows them to immigrate to Canada as pharmacists. For applying, you must meet the selection criteria of the program. Furthermore, it considers the factors of work experience, language skills, education, age, employment, and adaptability. There is a requirement of scoring 67 marks in selection factors score from 100 to qualify. Education Credential Assessment is an important document. Moreover, the pharmacists must verify their degree through the Pharmacy Examining Board of Canada. This is a means to prove that the qualification is equal to the standards set by Canada. It takes eight weeks to get the ECA, and it is necessary to fit it into the plan for immigration. Clinical pharmacists can apply through BC PNP for Healthcare Professionals. It is an ideal way to get PR in the province in a quick manner in comparison to conventional visa programs. Complete an online application in the BC PNP and apply for the post of a Healthcare Professional. After completing the application on the BCPNP Online, you get a score depending on occupation/experience. In case it is high, you get an invitation to the province and can also apply to seek the Canada PR. In case you decide that Canada is an ideal place we are ready to help you to realize your dream. Please Contact Us.